Of the two names in the title of this thread, which do you consider is correct for the TMP and Movie era Enterprise and Enterprise-A? Me, I support the name Enterprise class. And yet in virtually every canonical reference such as Star Trek.com and the Star Trek Encyclopedia..the refitted Enterprise and Enterprise-A are referred to as Constitution Class refit. If the original Enterprise had been decommissioned and dissasembled and then a brand new ship been built in her place with the current design then Enterprise class would be a valid designation. However, even though she only shares the shape of the original Constitution, she still has the core-members of her original spaceframe, minus her warp nacelle pylons. Her saucer section and connecting dorsal were added on to, but if you stripped that stuff down..the original is still there. That's why I would keep referring to her as the Constitution class refit. She's probably the only ship in Starfleet history to undergo such a drastic refit, and thats why she's such a legend. Starfleet was willing to do whatever it took to keep the Enterprise at the forefront of the fleet. CptBenSisko wrote: And yet in virtually every canonical reference such as Star Trek.com and the Star Trek Encyclopedia..the refitted Enterprise and Enterprise-A are referred to as Constitution Class refit. If the original Enterprise had been decommissioned and dissasembled and then a brand new ship been built in her place with the current design then Enterprise class would be a valid designation. However, even though she only shares the shape of the original Constitution, she still has the core-members of her original spaceframe, minus her warp nacelle pylons. Her saucer section and connecting dorsal were added on to, but if you stripped that stuff down..the original is still there. That's why I would keep referring to her as the Constitution class refit. 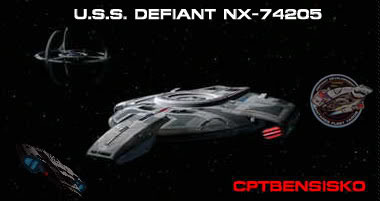 She's probably the only ship in Starfleet history to undergo such a drastic refit, and thats why she's such a legend. Starfleet was willing to do whatever it took to keep the Enterprise at the forefront of the fleet. I agree with your assessment Sisko, I always considered her just a refit of the original vessel. It is my second favorite class of vessel just because of its 'refit'. Definately Constitution Refit as that is exactly what it is. The original was a fine looking ship but could really be called the draft of the finished project which I have always believed the refit to be!! You guys do recall that the TOS version wasn't the original design of the Constitution class? She had gone through several refits prior that weren't drastic enough to qualify for the new class designation like the TMP refit. You guys also forget that the highest canon for any sci-fi is on screen. On screen in ST II, we see the name "Enterprise class".